astrid loves a very simple design, which should also be large, with in mind something she can wear everyday. an easy project to knit, a sweater to wear all the time. the hood is definitely bringing an original touch to the design, and as she says "I love hoods!". it's true that you can very often catch her hidden under a hood in the evening while she is knitting on the couch. 02_ custom colors : you can choose any color of our "le gros lambswool" + one "worsted" from malabrigo. you can discover all of the shades on the wool product page and just fill out the form underneath ! the wool : it is the biches & bûches "le gros lambswool", a natural and 100% lambswool from scotland. astrid knit this sweater with needles 4mm / UK 8 / US 6 and 4.5mm / UK 7 / US 7 + 4mm double pointed needles for the lower part of the sleeves, but you can also just use your circular ones - which you can find in our tool shop ! kit sizes : each size has its kit ! 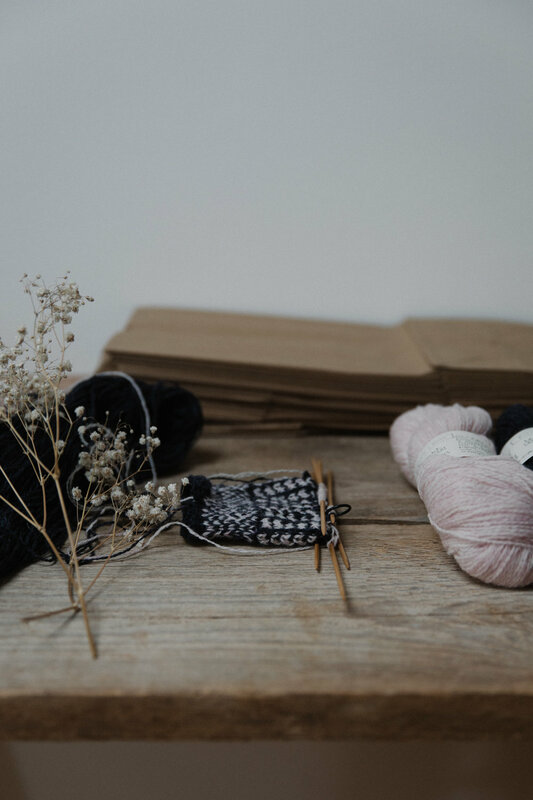 the knitting kit: your kit contains the wool in the chosen colors and for the chosen model size + the pattern in the selected language + the little biches & bûches knitting pouch. construction : the sweater is knit in the round, top down. thank you ! message received at the atelier !